Our little Prince stayed a bit longer! And there is a reason behind. First of all it had to be clarified by DNA-Test who his father is. We thought that his father is "Ewtor McEwan At Nadavin" which was confirmed by the test. 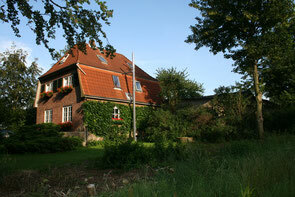 The first plan, where Arthur should live, didn't materialize in the end. I had quite a number of requests for the puppy but I hesitated. I suppose there would have been a number of good homes but none seemed appropriate as I didn't want to lose him for breeding. Well, and as it often is in life, the best comes last! Prince Arthur is now called McGregor and he moved to the North of England. He lives with Charles and Jill Holgate at Kennel "Nadavin" and is co-owned in partnership by myself. I am very happy about this and I am thankful that Charles and Jill will give him the perfect home! 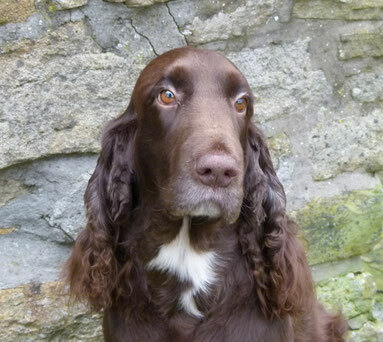 "Prince Arthur", aka McGregor, will shortly get his own web page. It has been a while since we tried to take photos of Arthur. Mainly because he was just not very happy to be stacked. And to tell you the truth, this photo is almost a miracle. And I know it is not perfect! And because of the heat this summer there were also not really nice shots outside possible. No green gras, everything yellowish and dirty. But as you can see, Arthur has grown into a nice little fellow. Meanwhile it is basically clear where he will move. But this will be revealed when we have final confirmation who is his father. 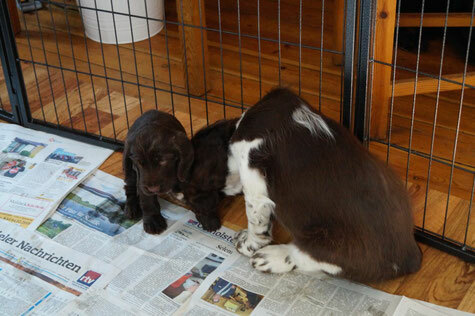 Before Otto, the last Springer puppy from the O-litter, moved out, we took the opportunity that he meets Prince Arthur. They had a bit of fun together. 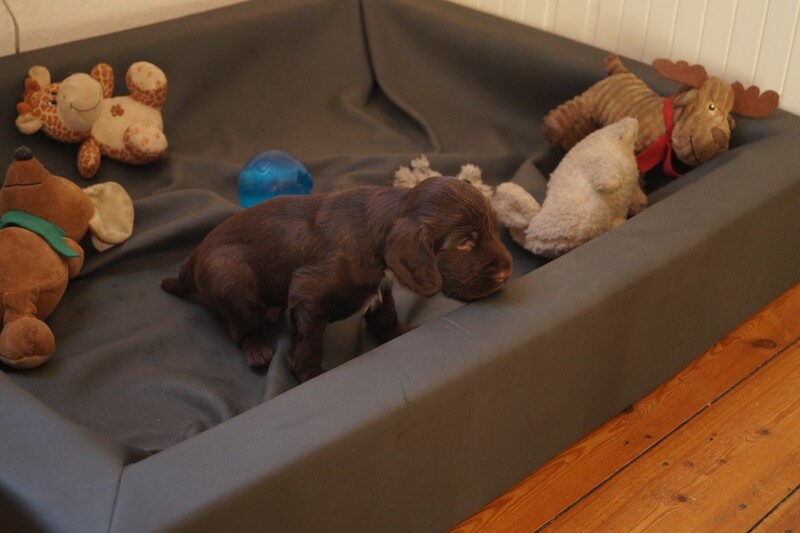 It is so important that Arthur gets to know other puppies. Last weekend we tried to take some photos in the stand. Well, Arthur was really jumpy and didn' t want to be stacked. But there is a photo of him after the not so successful photo session, which is nice. We will work on producing something nice with a properly stacked Prince Arthur! Our little prince continues to develop very well. He is exploring his small world more and more. As he has no siblings he has to play a bit with his Mum, what he started to do. I try my best playing with him, certainly more than with puppies in a bigger litter. 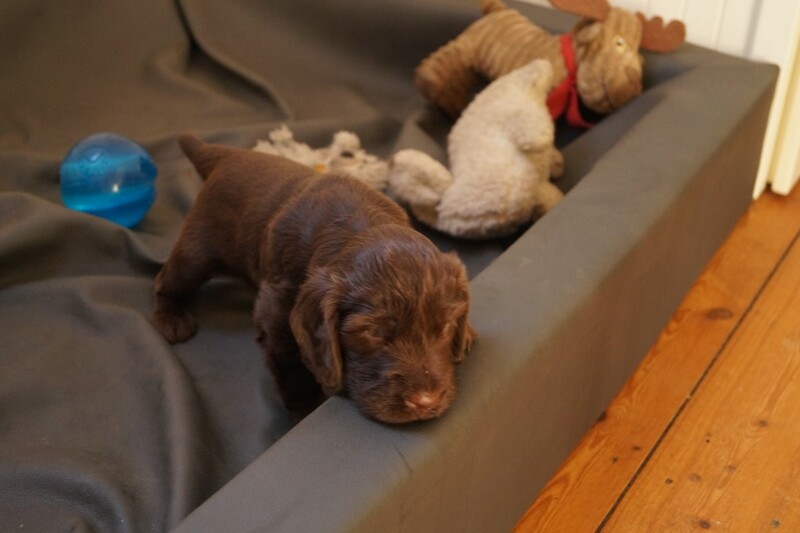 Nevertheless he is a charming puppy who is very nosy and active. You have probably noticed on the photos that he his docked. Under German Animal Protection Law it is allowed to dock dogs when they will be used for hunting (§ 6, Abs. 1 Nr. 1 Buchst b TierSchG). 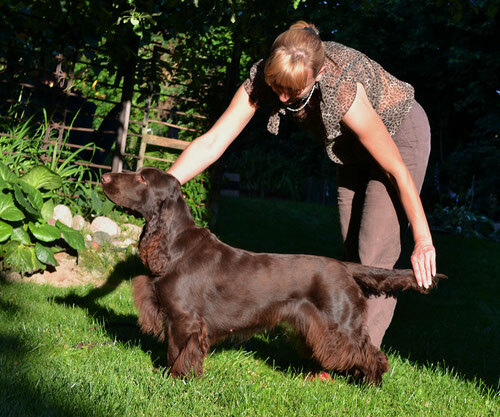 Owners of Field Spaniels know that there are problems with the tails even during normal daily life. 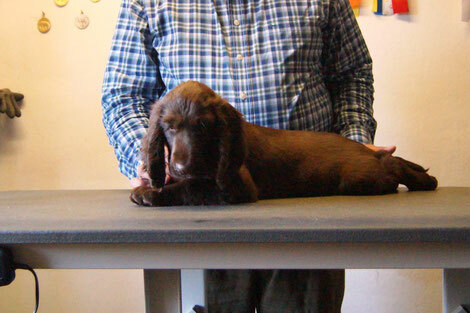 Field Spaniels are often very active with their tails and easily hurt the tip of the tail. When this happens they start bleeding badly and it takes a lot of time to heal. It must be also very painful for the dog. For this breed I still would prefer to dock them for this reason, luckily we are still allowed to dock them for hunting! 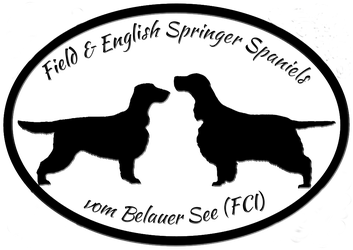 This applies to me for Field Spaniels, I have a different view on English Springer Spaniels. 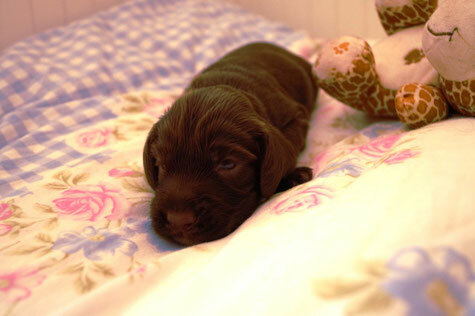 Meanwhile we have decided on the name of the little prince, he will be "Prince Arthur vom Belauer See". Prince Arthur was the third son of Prince Albert and Queen Victoria and the brother of Princess Alice and Princess Louise. 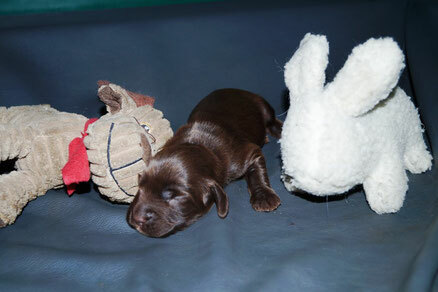 Although in this case "Albert" is not the father like of the N-litter, we just ignore this small detail. Prince Arthur has been the last surviving son of Queen Victoria. He served as Governor of Canada and was "Duke of Connaught and Strathearn" and "Earl of Sussex". He lived May 1st, 1850 until January 16th, 1942. 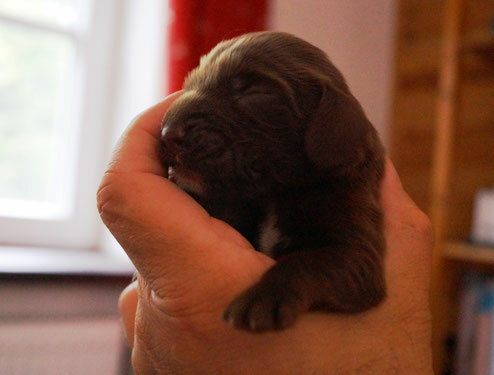 Our Prince is now 12 days old and has opened his eyes. It seems that he is not developing slower than other puppies. Sometimes singletons seem to develop a bit slower that others. After exactly a week he had doubled his birth weight. So far I am very happy about his development. Little Prince is developing nicely and growing fast. He isn't anylonger as skinny as he was at birth. He has developed already in a cute and roundish puppy. I love that! On June 19th our "Winterbourne Move On To Belauer See" gave birth to her little prince. It was the 68th day of her pregnancy. It has been a long, long wait on this puppy. 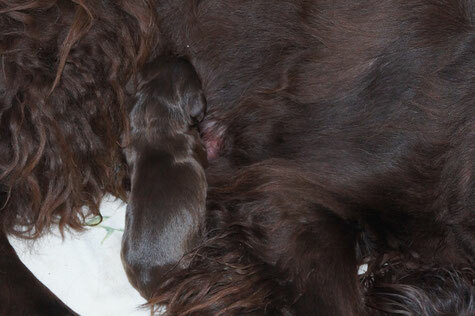 The birth was totally normal without any complications. Very often this is different if there is only a singleton. The boy is quite small. He weighed 275 g at birth. But in the end, who cares!? Small puppies can also grow into handsome boys! He is very active and suckling a lot. 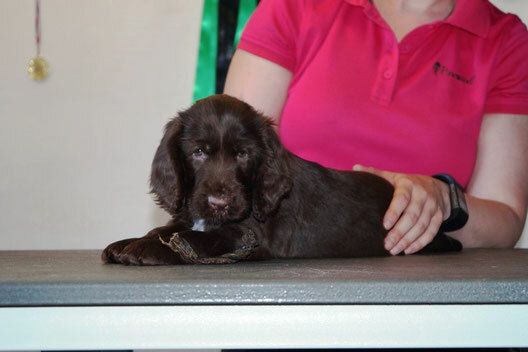 Our Vicky "Winterbourne Move On To Belauer See" has been mated on April 12th and 13th, 2018 at Kennel Nadavin in the North of England. We hope for puppies around June 13th, 2018. I have thought about something special for this litter. 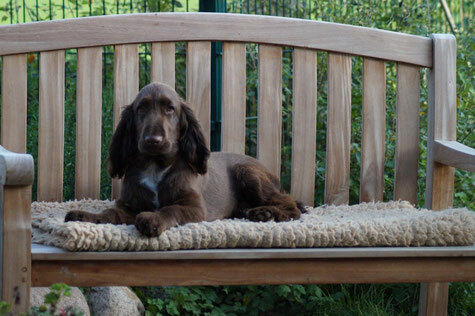 Field Spaniels are worldwide an extremely rare breed. 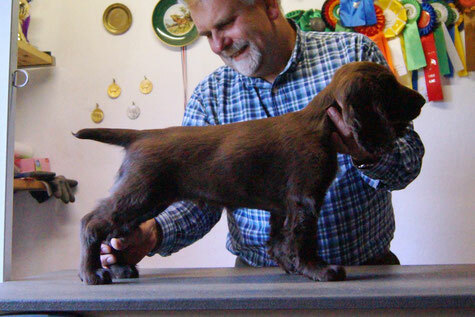 Matings have to be very carefully planned to minimize the inbreeding in the breed. Personally I think that it is even more important in a breed with such a small genepool to plan matings for a high genetic diversity. 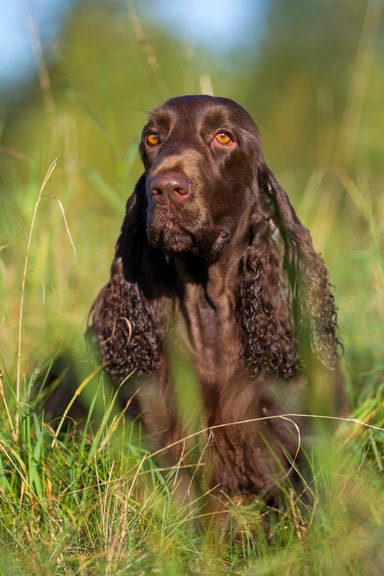 Quality and health should be always in the focus of a breeding, but with the Field Spaniels it also has to be the goal to keep the breed alive. Every breeder should be aware of this. Therefore it is very essential to keep a high genetic diversity. Laclan, as the Sire is called, has a Hip Score of 7/3, eyes are clear. Laclan is almost 10 years old and he had a brilliant show career. 9x he has been BOB at Shows, he gained 18 CC's and 18 RCC's. 2009 he was Best Puppy, 2012 and 2015 Best Dog at Crufts. 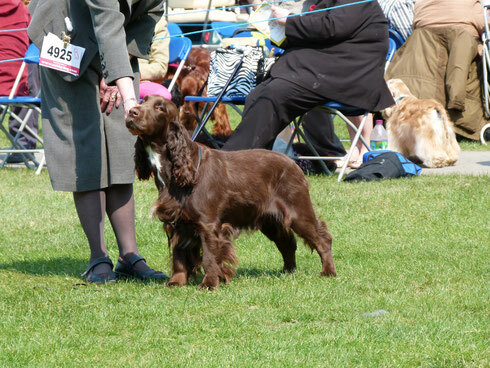 2012 Laclan was Top Field Spaniel. He was Top Stud Dog in 2013, 2014, 2016 and 2017! 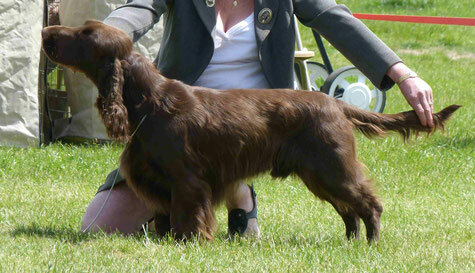 He is Sire of the BOB at Crufts 2013. Rothesey is called Fergus. His Hip Score is 3/5 and his eyes are clear. Fergus won 3 BOB's, 7 CC's and 21 RCC's. 2011 he was Best Puppy at Crufts. In 2013 and 2015 he has been Reserve Best Dog at Crufts. The puppies will be tested before registration who will be the Sire.